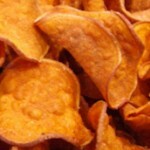 As often as not simple recipes like this one for spicy sweet potato chips are among the best. They’re easy to execute, are consistent every time, and let your mouth focus on the few flavors present with none of them fighting with the other for dominance. Heat the vegetable oil to 350 degrees in a deep skillet. 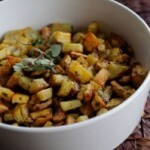 Separate the potatoes into 6 portions. Fry each batch, turning once, for 1 minute or until they are golden. With a slotted spoon, transfer the chips to a paper towel to drain and cool. Continue until all potato chips are fried and cooled. Place the red chile powder in a medium sized plastic bag. Again working in batches, place the chips in the bag and close. Shake the bag gently to dust the chips with the powder. After each batch is dusted, transfer to a napkin-lined basket and serve.